UPDATE: New information gathered since the New Paltz refueling fire occurred earlier this week, places the blame on static electricity as the cause of the accident. PEI (Petroleum Equipment Institute) spoke with the New Paltz Fire Chief Patrick Koch this week about the refueling fire and he made available two new pieces of information about the fire that were discovered after an extensive investigation of the scene and another interview with the victim, Matthew Erhorn . First, although the motorist said that he chocked the nozzle open with his gas cap (latch-open devices are not allowed at the station in New Paltz), no gas cap was found at the scene. However, a full Bic lighter was discovered two feet from where the car was fueled. Furthermore, Erhorn later stated that he reentered his 1994 Isuzu Rodeo during the refueling process to look at his odometer and then slid out of the vehicle to complete the dispensing process immediately prior to answering his cell phone. In view of this new information, New Paltz Fire Chief Koch issued the following statement about the fire: "Upon further investigation of the accident scene and another discussion with the victim of the May 13 gasoline station fire in New Paltz, I have concluded the source of ignition was from some source other than the cell phone the motorist was carrying. Although we will probably never know for sure, the source of ignition was most likely static discharge from the motorist himself to the nozzle dispensing the gasoline." PEI has been studying the issue of refueling fires and static electrical discharge at the gas pump since 2000 and has never received a confirmed incident implicating a cell phone at a gasoline station anywhere in the world. For more information please visit www.pei.org/static. New Paltz, NY — Matthew Erhorn, a student from SUNY, New Paltz is recovering from burns after a fire at a gas station while he was refueling his Isuzu SUV. Matt believes it was his cell phone that sparked the fire. If true, this would be the first case where a cell phone actually ignited a fire. Attempts to contact Mr. Erhorn were unsuccessful. At the ESD Journal, we believe there is a very remote change that a cell phone could start a fire but it would not be from its own static charges or its radio frequency signals. So many other things are much more likely to have caused the fire. The cell phone's radio signals do not have enough energy within them to start a fire. The cell phone does not generate static charges while being used. Fire Chief Patrick Koch was quoted as saying that the problem was definitely a cell phone that caused the explosion. A cell phone that was ringing, and which Erhorn, 21, answered while he was pumping gas. At which point, the area around the nozzle of the gas pump ignited. Matt Erhorn was pumping gas into his 1994 Isuzu at the Route 299 Courtesy Mobil station at about 9:30 p.m. Thursday when he reached into his pocket and answered his ringing cell phone. At which point, the area around the nozzle of the gas pump ignited. The next thing he knew, there was a flash of flame. He then threw the gas hose to the ground and began to run. If it hadn't been for some fast action on the part of the station attendant, the explosion would have been a lot worse. The night attendant inside the convenience shop, Mohamed Taiep, triggered the station's fire suppressant system. In a second, the vehicle and everything else under the station's canopy was covered with a white cloud of fire-snuffing chemicals that made the station look like it had been hit by a snowstorm. Chief Patrick Koch, New Paltz Fire Dept said, "I'm positive today, that as of last night, 9:30 last night, I'm positive that a cell phone can ignite." If true, The New Paltz incident is the first recorded instance of a cell-phone flare-up at a gas pump, according to Steve Fowler, a consultant in the field of electrostatics. Mr. Fowler stated that the chance of the cell phone causing the fire is very remote. It would have to have a battery problem causing overheating or rupture of the battery which should have been noticed by the user. The sparks which might come from a minor connection problem (especially during the phone's ringing cycle) inside the phone would be highly unlikely to have enough energy or distance to cause ignition. The vapors would have to be in the right place with the right spark to have an ignition of the vapors. Mr. Fowler went on the say that the most like causes of such a fire is static or smoking. If smoking could be ruled out, then static is by far the most common cause of such an accident. 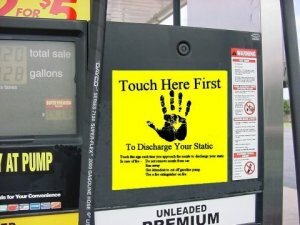 When gasoline is pumped through the nozzle, static electricity is created. This static is typically conducted harmlessly to ground by the connection of the hose to the car. If this connection is broken, there can be a static buildup, discharge and ignition right in the vapor rich space around the fuel port area of the car. For more information on this and other issues concerning refueling fires, Mr. Fowler may be contacted at 864-574-6415, email: sfowler@sfowler.com. By assuming a cell phone caused the fire, the real cause may be overlooked and be waiting for the next time to ignite. 1. The hose at the gas station could have a broken connection to ground at any of the many connectors in the system. 2. The Isuzu may have a broken connection between the fuel port of the car and the car body. 3. When Mr. Erhorn when reached for the cell phone which was ringing, he may have broken the connection of the nozzle and the car, or his hand and the nozzle allowing a static discharge in the vapor rich areas. Since Mr. Erhorn could not be reached, we may never know for sure. Many stories of cell phones igniting fumes at gas stations began circulating in the media and on the Internet since 1999. Those stories apparently came from Asia, though investigators have not been able to backtrack the anecdotes to the specific individuals or events. Since then, a good number of articles have been written that speculated on the subject, though no definite cases have been uncovered. And some have done experiments trying to create the proper conditions to ignite gas fumes with a cell phone -- none of which appear to have been successful. Signs warning consumers to turn their cell phone off while pumping were posted only inches away from where Erhron was actually pumping the gas. These warnings are due to a code which states that any electronic device used in an explosive or ignitable area must be explosion proof or intrinsically safe. Since cell phones are not designed this way, the manufacturers must state to not use them in explosive situations such as gas stations. Mr. Erhorn's injuries were reported as minor burns or singing to one arm.